Dependence on technology is high for the majority of modern businesses. If your data is stored on servers, you have till systems or rely on a telephone system to communicate with customers then you need to plan for Technology Continuity & Recovery. If I lost access to my office how would I replace PC's & Servers for key team members? Loss of access to your offices implies that the contents of the office are unharmed and can be used again as soon as access is regained. 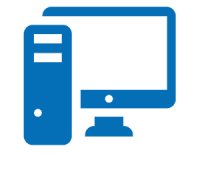 Effectively you will need a short term replacement PC’s and Servers delivered to an alternate office location. Our expert partner network can provide short term technology rental or alternatively many of our Workplace Recovery partners provide office space pre-equipped with hardware, please Contact Us for more details. We have a small on site data centre with backup to tape. If we lose the data centre how quickly could we replace the servers? We are dependent upon our telephone system. What steps can we take to make this system more resilient? It sounds as though you have an office based switch, which is in effect a single point of failure. You may want to consider upgrading to a Voice over IP (VoIP) telephone system which provides on premise functionality and a back up to a cloud based switch. Good VoIP systems will also provide remote login capability for remote working which can be really useful for Recovery situations. Our data network keeps running slow making it impossible to work, our provider assures us it is not their fault, what can I do? Finding the root cause of a network problem can be difficult. You may need to appoint a specialist Network Diagnostics/Network Assurance engineer to fault find the problem. We work with expert partners that can provide the monitoring equipment and expertise to find and resolve the issue. Will migrating our data to the cloud be more resilient than operating local servers?